Basic colour: Mid to dark brown with a brassy metallic reflection. Pattern colour: Elytra sometimes reddish. Pronotoum: Narrower than the elytra, sides evenly rounded just in front of hind angles which are minutely toothed. Status: Scarce. Recently only known from Suffolk. Formally known in Glamorgan, Kent and Sussex. Habitat: In dry open sandy places such as gravel workings, roadside verges and dunes. Other notes: Hind margin slightly sinuate, foveae distinct and punctured but without ridge inside the hind angles. Scutellery pore absent, elytral striae narrow and finely punctured, intervals almost flat. Wings present. Ramsay, A.J. (2011). 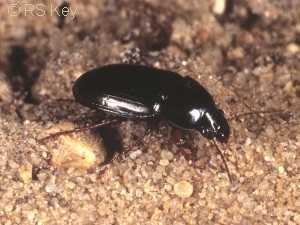 Amara fusca Dejean (Carabidae) rediscovered in Wales: the first Welsh record for over 150 years. The Coleopterist 20(2): 93. Telfer, M.G. & Eversham, B.C. (1994). Amara fusca Dejean established in Britain. The Coleopterist 3(2): 35.